FETC wrapped up on January 26, and we learned all about how to create a makerspace to enhance digital learning in the classroom. Long before tech learners graduate and head to the incubators of Silicon Valley, they learn to build vital technology and communication skills in the elementary school classroom. To be successful digital communicators, children first need to build foundation skills like social-emotional acuity and critical thinking. Creating a makerspace in your classroom offers a designated place for students to do this through innovating and tinkering with hands-on materials. So what exactly is a makerspace? A makerspace is a place in the classroom, such as a table or countertop, that is stocked with crafty materials for students to design and build their ideas. These spaces in the technology classroom are an effective way to move students beyond consuming technology by instead giving them the opportunity to create it. The idea is to have a variety of multisensory tools that are available at the child’s fingertips. You don’t need expensive 3D printers or laser cutters to implement a successful tech makerspace. Simple, hands-on materials are all you need to cultivate the resourcefulness that builds skillful STEM students. Stock your makerspace with knick-knacks like batteries, light bulbs, used and donated electronics, wheels, block shapes, paper, and writing tools. 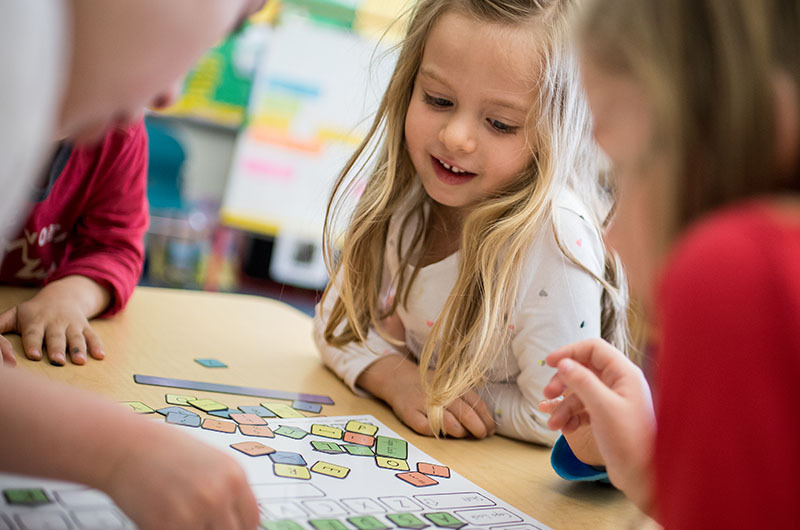 These uncomplicated multisensory tools give students the chance to ideate, conduct research, and create in a collaborative setting with their peers. Makerspaces also foster the “Four Cs”: collaboration, creativity, critical thinking, and communication. Students collaborate by helping each other ideate and build, and hone their creativity through access to a pastiche of materials. Critical thinking is fostered by testing ideas through trial and error, and they learn to be effective communicators through expressing ideas with their peers. These tinker tools become the building blocks for robots, maps, architectural structures, and other imaginings of children. Beyond the creation of the physical project, vital communication skills are strengthened through collaborating with peers, expressing ideas, and testing hypotheses. Students gain the confidence and critical thinking needed to succeed with digital communication and technology in a classroom setting. Once students have the basics of technology and communication down, they are better prepared for digital classroom instruction. With makerspaces, the possibilities for success are as endless as the ideas of the children who use them!